Western intelligence agencies must be able to intercept any communications in order to thwart potential terror attacks being hatched by extremist groups, and this must be done without violating citizens' rights, US and British leaders said. Cameron has taken heat from privacy proponents in recent days for advocating a plan that would assure UK investigators are able to pry through the digital conversations of suspected terrorists by banning encryption. President Obama fell short of endorsing that platform during Friday’s meeting, but said the US and UK governments must ensure national security is preserved along with the privacy of American and British citizens. "Given the urgent and growing danger of cyberthreats, we have expanded our collaboration on cybersecurity," Obama said, adding that he believes technology companies would want to see potential “tragedies” prevented. 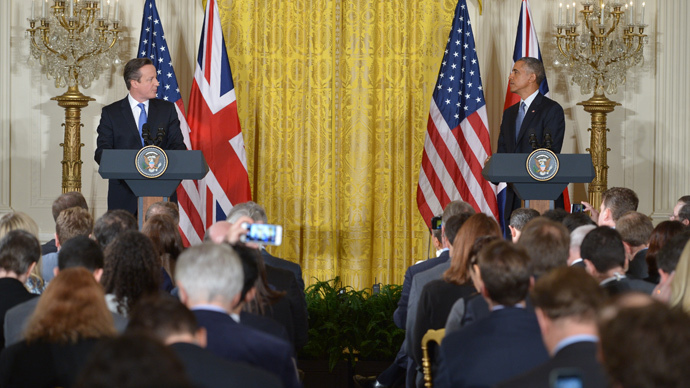 The countries would "deepen our cybersecurity cooperation" in an effort to "keep pace with new threats," Cameron said. He was more privacy concerned during the conference, saying the governments don’t need “backdoors” when they can use front doors. Terrorist groups are proficient in coordinating over the web, Obama said, although American intelligence agencies are, at this point, able to intervene when necessary. “When we have the ability to track that in a way that is legal and forms with due process, rule of law and presents oversight, then that’s the capability that we have to preserve,” Obama said. “The biggest damage that was done as a consequence of the Snowden disclosures was, I think, in some cases, a complete undermining of trust,” Obama added, referring to the unauthorized disclosure of National Security Agency documents, including files exposing the NSA’s vast surveillance operation involving the communications of Americans and foreigners alike.